Hitachi C12FDH vs DeWalt DW715: Which One's Best? Hitachi C12FDH vs DeWalt DW715: Which One’s Best? This review pits the dual bevel Hitachi C12FDH against the single bevel DeWalt DW715. This may sound like an uneven competition based on this feature mismatch alone. If maximum project efficiency and convenience are paramount, the choice is the C12FDH. For other users’ needs, the race is closer. The C12FDH offers more flexibility and ease in performing complex cuts with its dual bevel capability and built-in vise assembly. The beauty of this feature combo is that the user can leave the workpiece in place and flip the saw. This eliminates the time needed to flip the workpiece and realign it for cutting. The DW715 can cut larger pieces of stock. It has a very robust design built around a machined base with hardened detents included for both bevels and miters. Users interested in a rugged, high-capacity tool will gravitate to the DW715. For users looking for the convenience of a laser marking system, the nod is towards the C12FDH, as the DW715 does not come with that feature. Still, the DW715 isn’t completely out of the running. Read on and see which tool is best for your needs. Think of this as a competition between the sophisticated and capable C12FDH and the rugged and straightforward DW715. 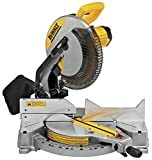 Both saws come with 15-amp motors producing 4000 no-load RPM. The belt-driven C12FDH has 1950 watts of power, compared to the DW715’s 1600 watts, so it will better handle tough cutting through dense wood and knots without bogging down. The C12FDH’s dual bevel capability advantage is offset by the DW715’s capacity to cut larger stock, both crown molding and regular lumber. As of writing this, the Hitachi saw is priced about 15% higher when compared with the DeWalt’s price tag. With the dual bevel capability and laser marking system of the C12FDH, this price difference seems well worth the money. For users strictly interested in price, the DW715 is the choice. The DW715 is a more robust and durable tool. It uses steel to reinforce the bevel and miter detent points. What this means to users is less wear over time, and retaining original accuracy longer. A machined base provides a better fit with fences and accessories. Those users with a need for the greatest durability will like the DW715. Both saws exhibit thoughtful design when it comes to usability. The controls are easy to access, and adjustment is crisp and secure. Properly placed handles provide maximum control during operation. Both tools feature carrying handles to simplify moving the saws from one spot to another. There is no clear winner in this category. A more technical consideration is the difference between the C12FDH’s belt-driven motor and the DW715’s direct drive motor. The belt drive provides smoother and quieter operation, and the C12FDH does deliver more cutting “oomph.” The DW715’s direct drive motor eats into this advantage to a degree with its automatic electric blade brake. Safety is always of paramount importance, so you should never have body parts near the blade until it stops, brake or not. A couple of seconds saved with the DW715’s brake does not outweigh the C12FDH belt’s benefits. The C12FDH is the more sophisticated and flexible saw in this match-up. The rough and tumble saw of this duo. Writing reviews is always interesting. Inevitably, there are those that swoon over their tool and how it performs, and then there are those who feel it has no redeeming value outside serving as a boat anchor. That is the case in this competition. As usual, user experiences were heavily skewed to the positive. What did people like and dislike? Both saws received high marks for accuracy out of the box and accuracy in use. Making changes to the cut geometry was easy with both. The smoothness of the cuts produced depended on the quality of the blade used. Both saws come with a capable general purpose blade, but you will want a better quality blade for the smoothest cuts. On the negative side, neither saw offered an acceptable dust collection system, especially if you want to connect it to a shop vac system. Both require an accessory adapter or duct tape. Saws arriving damaged was an issue for both saws, with the packaging for the DeWalt being singled out repeatedly as subpar. Both tools experienced issues with the sub-fences being flimsy, prone to damage, and arriving out of square. The DW715 had some issues with bowed main fences and very difficult blade changes. Let’s wrap this up and see who the champ is between these two saws. Based on the feature set and capability, the nod has to go to the Hitachi C12FDH. Even at a slightly higher price (as of writing this), the flexibility that its dual bevel capability provides, along with the convenience of the laser marking system, are worth the extra money. Since neither saw is likely capable enough for professional-level finish carpentry, the best home for the C12FDH is in a homeowner’s shop or for use in light commercial carpentry. The extra two years of warranty is the icing on the cake. That doesn’t mean the DeWalt DW715 is a poor choice. For users with very strict budgets and no particular need for the flexibility provided by the C12FDH’s compound bevel capability, the DW715 will satisfy their needs nicely.